Liliums are on at the top of my favourite cut-flower list! 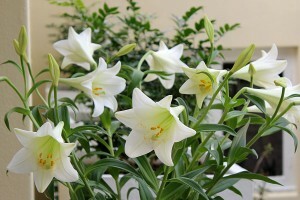 Liliums and Dutch Irises to be exact, but St Josephs Lilies are easier to purchase here. 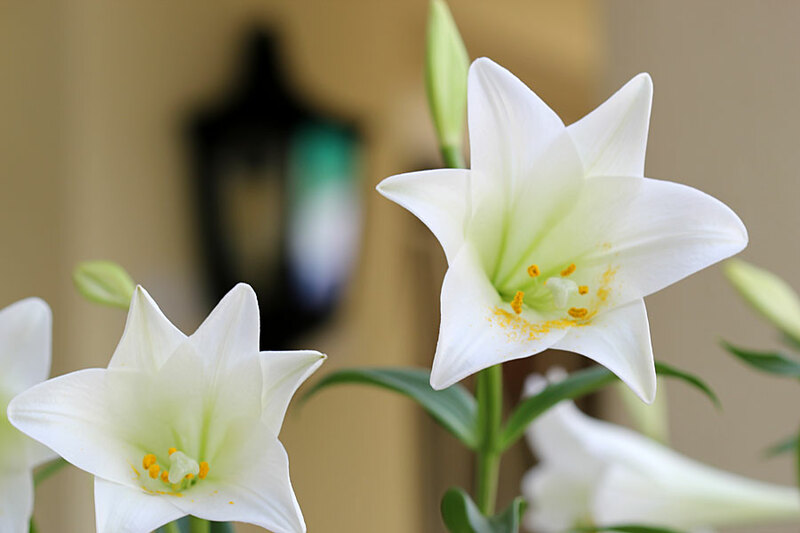 Every two weeks throughout winter I hotfoot it to Woolies and buy two bunches of St Josephs Lilies for the very large vase which lives on the table as you enter my home (via the back entrance). The flower filled vase is also in my direct line of sight whenever I glance up from the computer screen in my office. So now you understand just how much I love these Lilies. I want to see them all day long, and I do. And I smell them. They fill the entrance of my home with their lovely scent which can be a bit overpowering in winter if doors and windows are kept closed for too long. I love the huge vases filled with these beautiful flowers I regularly see in Home Decor magazines. 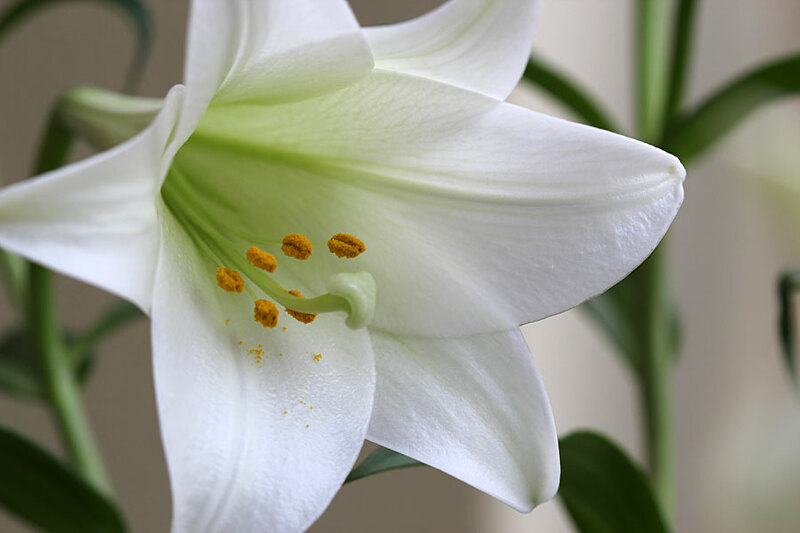 Huge vases filled with these long stemmed white lilies – I love the green colour of the foliage, the way the flowers stand upright, the beautiful glossy petals … to me they are the perfect “architectural” blooms. One lily on its own in a long slender glass vase, 20 or more in a massive ceramic vase … always perfect. Always beautiful. And the cut Liliums I buy for my vase always last at least two weeks, sometimes more. If I love them so much, why don’t I have them in my garden was the question I asked myself when I saw Hadeco were selling Lilium bulbs online. Because I didn’t know that they are easy to grow. I didn’t know you could just buy the bulbs, plant them in the right place and then sit back and enjoy their lovely blooms in a few months time. I thought anything this beautiful must be massively difficult to grow. Which is why I keep buying them as cut flowers. But having seen them for sale and reading that they are easy to grow – well it seems like a no-brainer that I should at least try. So after much online research and finally convincing myself that I can do this and have a few “perfect places” for them, I took the plunge and ordered. 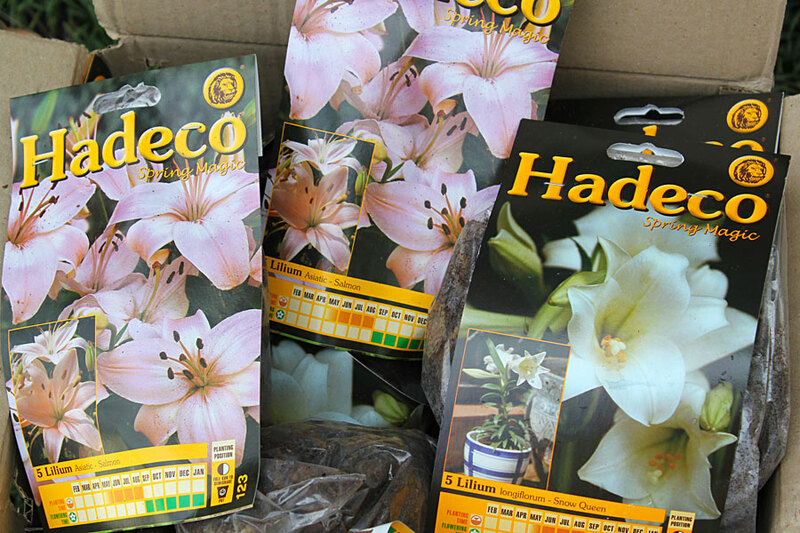 Two days later they arrived in a box, 3 bulbs per pack of the varieties I bought and the kind people at Hadeco included 30 extra bulbs of Mixed Asiatic Lilies for free! I have no idea why I got the extras, but thank you Hadeco – I will plant and love them! I’ve spent the whole afternoon cleaning up and preparing the bed where I plan to plant my Lilium bulbs! Then it got dark and I had to stop for today. Wish me luck with these – I’m really excited about having them in the garden. I’d love to hear from anyone that has Liliums growing in their garden – How do they grow for you? I’ve found them VERY easy to grow!! I bought my bulbs from Hadeco (most nurseries stock them but I bought online at Hadeco.co.za) and as long as you put them in a partly shaded (semi-shade) position so they don’t get burnt in your heat, they should thrive. I bought a LOT of these bulbs and only one didn’t make it – because it was in a position where it got fried by the sun. So heat is ok, and some sunlight is ok, but not all day baking hot sun. (This is my experience). The bulb people say they can take full sun, but I found that too hot for them. 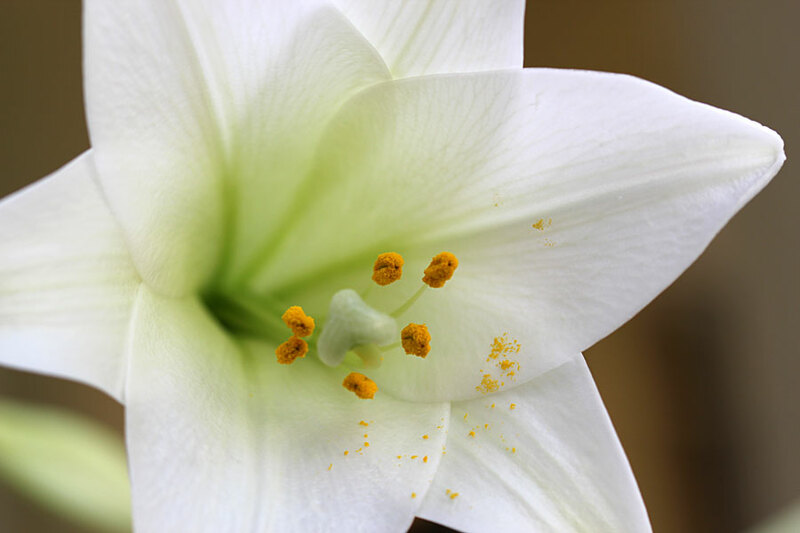 I love the detail on the lily photograph. Oh Chris! These are just beeeaaauuutiful! That is one impact I always get when I visit you – the vases of fresh flowers! It is a wonderful thing to have fresh flowers in your home. Flowers are the soul of all plants and when you bring them indoors you bring in all their goodness and love! Really a joy to see and fell! THanks for that! It has been dreary with the rain. You brightened my day! 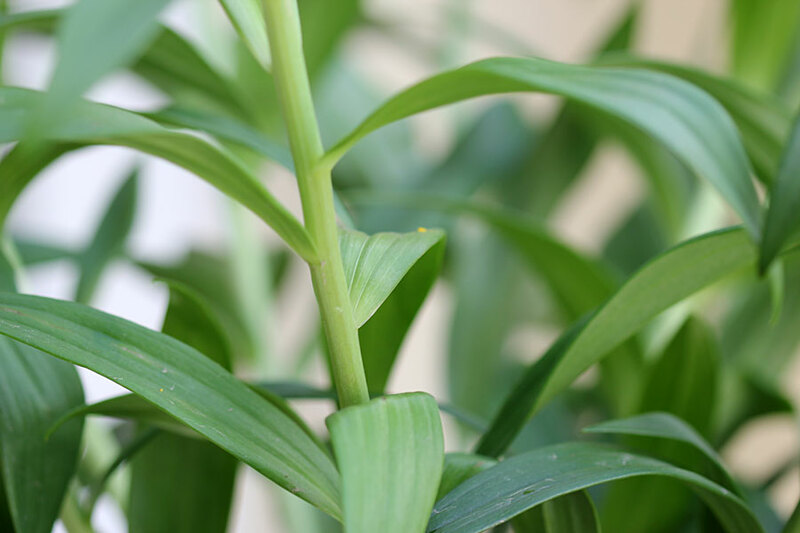 I have bought a packet of 8 mixed lilium corms (well, they weren’t free, but at 6$ they were close enough) and am really looking forward to see if they will bloom in a large pot in our courtyard. If they’re a success I will definitely add more to the garden next year, in spite of the fact that they need to be taken up each winter in the Danish climate. In Denmark you’d have to bury them 15 inches below ground to be pretty sure they escape the frost, and in that case I doubt they’d be able to make it up next spring, so the corms need a bit of care over the winter. Same goes for glads, dahlias and a lot of the other more spectacular flowers of exotic origin, so they live in pots in our courtyard where they can be easily dug up for winter. I love lilies too and your white ones are just the prettiest. There is something about white blooms that just catches my eye. Even more wonderful is that they brighten up shady beds. Beautiful shots. Thanks Lona! I’m hoping my bulbs will brighten a rather drab spot in my garden. I wish all nurseries had “buy 3 get 30 free!” sales. Hehe, me too, but truth is I bought 100 and got 30 free! not all 100 are for me – some are a gift for someone who also loves them. I used to grow them years ago, but went off them when the yellow pollen stained my clothes yellow! They seemed to grow like weeds though – very readily. Please fill lots of vases with them when we come in November! That’s the idea I read that they start to flower in November so timing is perfect. 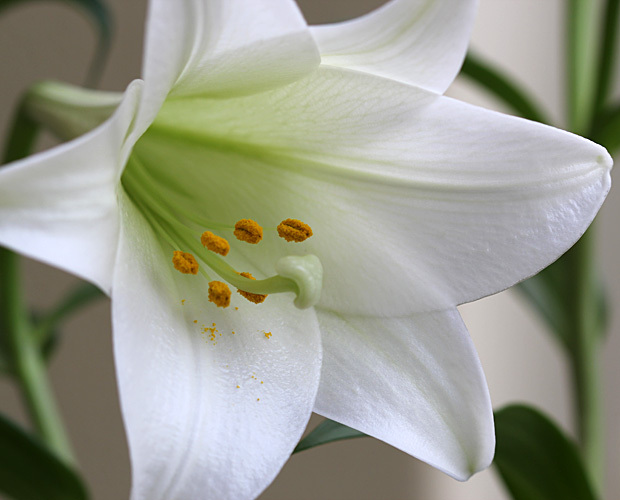 I love lilies, too, and they are so much fun in the garden – like most bulbs, they are a sweet surprise when they shoot up! I hope you have great success with them. Your garden must be so full of bulbs – any room left for plants? Hi Ronnie – I love that idea of putting them in a bowl! Thanks! Do you grow Lilies too? I wish I could grow Lilies, it would save me a lot of money! I have tried but they are reduced to green sticks, thanks to the snails and slugs, despite all deterants known to man. If you’re interested, on your way into Hout Bay from Constantia Neck there is a nuursery (opposite the cemetary) which sells day lillies – I think they’re advertising them at R20 each. Don’t know if they’re open on Sundays. Hi Danni – Thanks, but these are not the same as daylilies. Liliums (Lilioideae) are different to Daylilies (Hemerocallis). Daylilies only bloom for a day and I want these as cut flowers to bring inside. I do like daylilies but I don’t want them in my garden (yet). I might change my mind down the line though. Really lovely photographs! Well done.